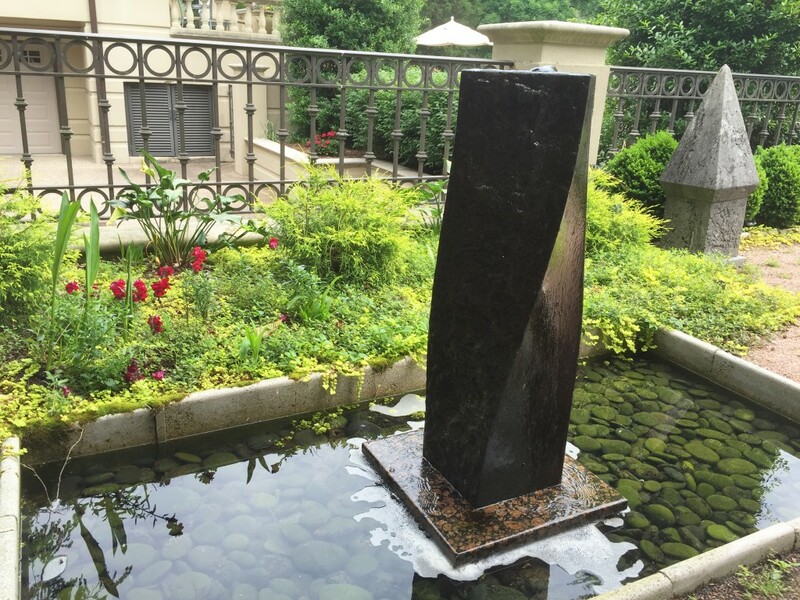 The inspiration for this piece came from the fountain in our gazebo. When I was watching the fountain, I saw frolicking tadpoles intermingled with the leaves and flowers. Upon pushing my imagination further, this scene reminded me of Claude Monet’s “Water Lilies”. Therefore, Opus 278 was born. It’s not taken from any specific Monet painting, but it’s from the impression I got from that fountain and my imagination. If you don’t see any tadpoles in the composition, that’s because I want to keep them in the pond! I’m fascinated with dancers and ballerinas. Recently at OZ, we had a very successful dance performance by New Dialect. That made me think of Degas’ “The Little Dancer”, that I have seen in different museums including recently at the Norton Simon museum in Pasadena. Since it’s spring and I’m painting a lot of flowers, I wanted to combine flowers in the dress of the little ballerina. 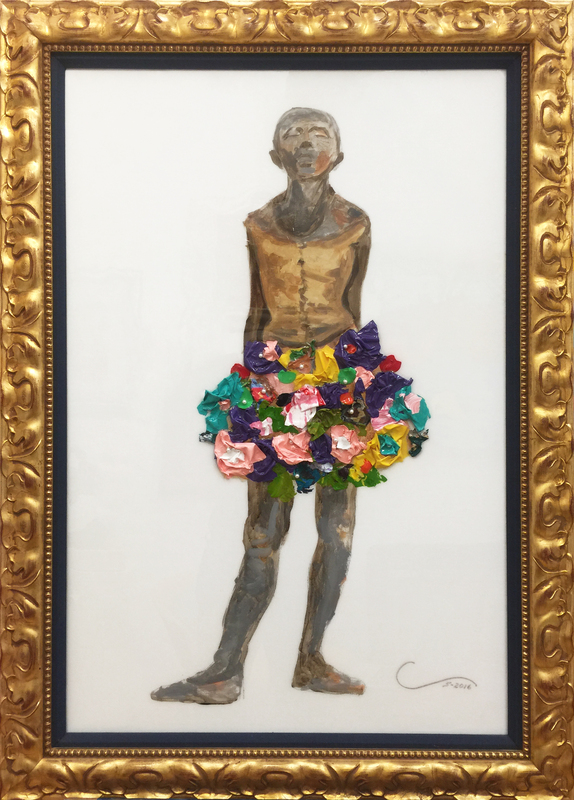 Thus this new work, Opus 271, which depicts my new concept of Degas’ little dancer with a flowery tutu on a white background. I hope you will like it. Since March 14 was Pi Day, I was inspired to create another painting featuring rainbow colors with Pi. 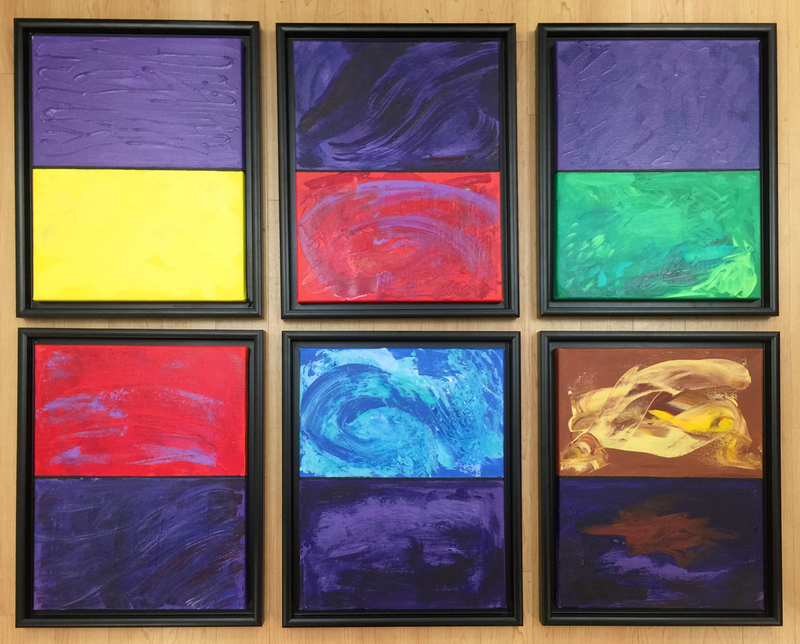 Thus, here are the first six numbers of Pi (3.14159) in six canvases represented by the colors of the rainbow, in a field of purple. I hope you will like it. One of my favorite cigar tobaccos are the Sun Grown wrappers from Ecuador. 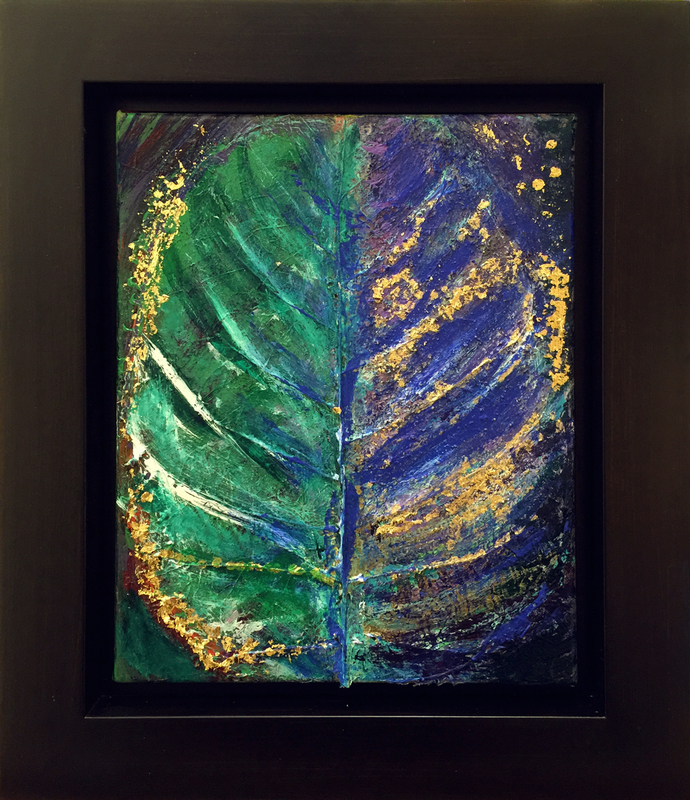 I used a beautiful leaf that came from that region to start this painting, and the addition of the colors came from one day to the other. It took me three weeks to complete the whole painting. 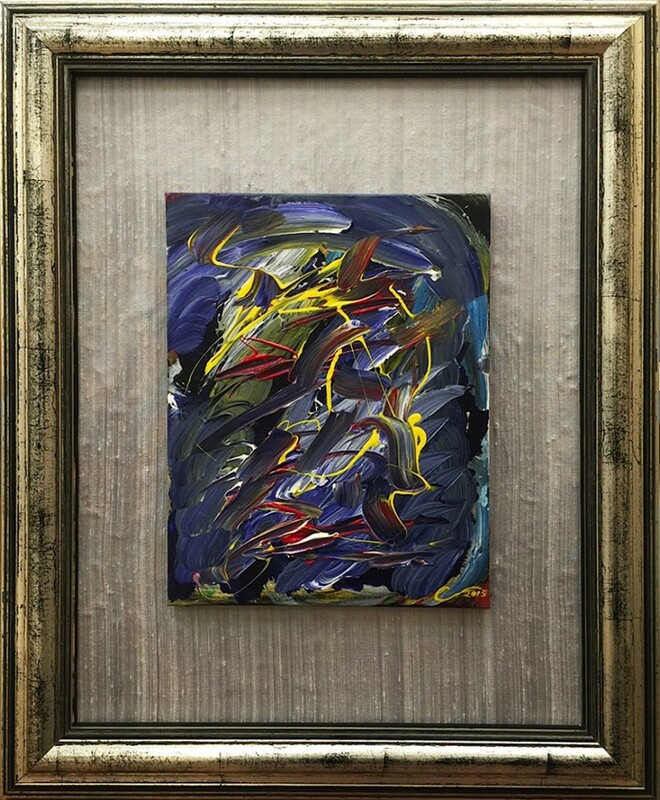 I chose a black floater frame to highlight the colors. I’m very happy to present to you our 2015-2016 artistic program, announced in The Tennessean over the weekend. It is a diverse program which is both culturally and emotionally satisfying, and features internationally acclaimed artists including Kyle Abraham, who received a MacArthur Fellowship (or “genius grant”) in 2013. This roster includes artists who are up-and-coming and whom we at OZ feel the world will be hearing about for many years to come. We will be kicking things off on July 16th with conceptual artist Stephanie Pruitt at our popular TNT (Thursday Night Things). Our second ‘Family Day’ will be August 15, bringing with it a presentation of newly invented musical instruments that nobody dreamed possible. This is just the beginning! We hope you will join us at these innovative performances. Dupioni (as defined in Wikipedia) is a plain weave of silk fabric, produced by using fine thread in the warp and uneven thread reeled from two or more entangled cocoons in the weft. This gives you a very lustrous and uneven surface, which reflects the light better. This fabric goes very well with the non-uniform surface of “The Tempest”, therefore, the silk background compliments the painting. Of course the color gray is very neutral and goes very well with the blues and the cool colors, accentuated by the yellows and the reds. The selected frame brings all these into focus for the viewer. I like innovations and coming up with colorful/unique ideas. 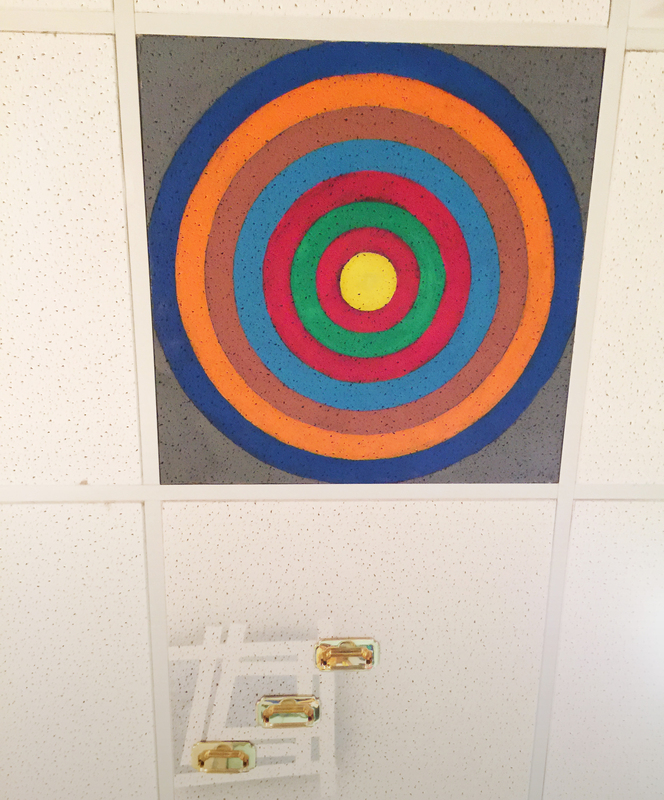 This week I wanted to do something fun in my office so I painted one of the ceiling tiles with Jammie’s and Farrar’s help. 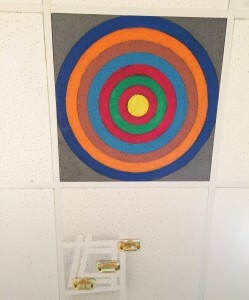 We decorated it with our Pi Synesthesia colors in circles. As you know, I like to use the color sequence of the color spectrum, starting with red for 1, orange for 2, yellow for 3, green for 4, etc (Roy G. Biv). It is now hanging in my ceiling. None of my employees have noticed it yet. However, my wife has seen and questioned it, but also liked it very much!